What’s In My Beach Bag… and Win a Gift Card! As I was doing my Friday morning ritual of cleaning out and re-packing my beach bag in preparation for a weekend of chasing my kiddo around the pool, I was laughing at the amount of things that I feel are “necessities” for our activities. Most of these “must-haves” can be found at Rapunzel’s Closet. This exercise inspired me to do the blogger’s “obligatory:” What’s In My Beach Bag Post. Sadly, this is only a portion of what I carry to the pool with us each weekend. The bag is still filled with tennis clothes, extra swim suits, rash guards, an additional outfit for both myself and my little, and clean Hanky Panky undies of course! I never forget my US Weekly Magazine either – it’s my mini-vacay while my little naps. Literally, the first purchase that I made after my son was born and we had “officially” announced his name, was my L.L Bean Boat and Tote Bag with his monogram. I truly believe that I cannot survive my summer without it. It seems to be bottomless and yet I can always find what I need. Of course you’ll see how many other bags I carry within it which makes it easier for me to find things. I also carry RCR’s Jesse Walker lunch bag. I love this insulated bag because I can fit all of his snacks and an ice pack fits perfectly in the inner pocket. It smushes easily to fit in my bag, yet doesn’t totally crush his snacks. I wish we sold these at Lil Rapunzel’s – I’d buy one for each day of the week. Another staple in my weekend life is my white waffle makeup case. It’s lined in plastic and holds my “pool” makeup in case we decide to stay for drinks or dinner. Unfortunately we no longer carry these in store, but there are plenty of places that offer a white monogrammed makeup case! I also happen to be a little obsessed with monograms in case you hadn’t noticed. I have a blonde hair, blue eyed child so I plow through sunscreen like it’s my job. I love the BabyGanics Sunscreen Spray because it doesn’t have bad chemicals. Something about the label and the big NO just makes me feel good about using this line. What I love about the spray is that I can cover a large amount of area before my tot starts running towards the pool. This isn’t an aerosol can so it’s not emitting fumes of any sort either! The newest additions to my beach bag this summer are my Hayden Reis Sailcloth Bags. I was carrying my Sunscreen around in a Ziploc, (apparently a big no-no) but now I have it in this super cute “sunscreen specific” bag. As an added bonus – the bright orange color makes it easy to find! I also love the Anchor Bikini Bag. While you won’t find me sporting a bikini while I’m chasing around a 2-year old, it’s great for getting all of our wet clothes home after a day at the pool. These bags are made of super durable and lightweight sailcloth and they are way more chic than a plastic bag! My son goes through no less than 4 bathing suits per weekend. I love this Snapping Turtle Kids simple navy swim trunk because I know that it will match whatever rashguard I have in my bag. These suits aren’t lined so they don’t leave marks on my toddler’s chunky thighs. Baby swim designers always forget that these little guys wear swim diapers for a while so they don’t need a liner. Snapping Turtle Kids really understands how to make a swim trunk for a little swimmer! When I got to the bottom of my bag I noticed that I had THREE different pairs of TKEES in the bag. My collection seems to have migrated from my closet to the beach bag. I have probably thrown a different pair in every weekend for the last month and never actually cleaned any out. Knowing me – I’d probably wear three different pairs in one day anyway. Totally normal, right? So there you have it – a long-winded tour of my personal beach bag. Now it’s your turn to tell us what favorite item from Rapunzel’s Closet is in your beach bag! Leave a comment below or post a picture on our @shoprapunzels Instagram Feed and #rapunzelsbeachbag and you will be entered to win a $50 Gift Card to Rapunzel’s Closet or Lil Rapunzel’s! Be sure to tag @ShopRapunzels too! We’ll pick a winner next Friday! Be Our Last Minute Valentine! There is no grey area when it comes to Valentine’s Day, either you love it or you hate it. At Rapunzel’s Closet ~ we love it. That doesn’t necessarily mean that we will be spending it being whisked away on romantic dates fit for The Bachelorette, we simply feel that celebrating Valentine’s Day is important. By important we mean it’s a socially accepted excuse to buy ourselves pretty things! Rapunzel’s has everything you’ll need to make this 14th as special as ever. Below are a few of the items we think Cupid would approve of, but we advise you to come in and see for yourself! 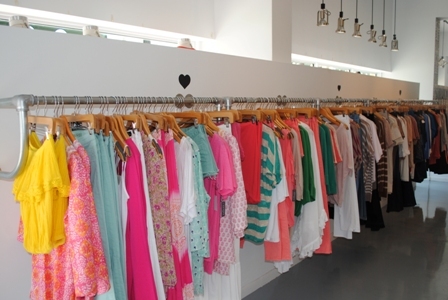 We’ve got enough cute pink skinnies and sultry red blouses to spare! And remember, love doesn’t only exist in the form of boyfriends and girlfriends, it’s also important to remember that our friends deserve a little lovin’ on Valentine’s too. So pick up your last minute gifts today and most important, don’t forget the chocolate! Take a break from stalking your latest crush and stalk our Facebook Page for more last minute Valentine’s Day gift ideas! Valentine’s Day is right around the corner and we’d be so sad if you didn’t have a special Valentine of your own. We’re volunteering to fill the void for all of you who are Valentine-less this year. If you love fashion and shopping we are a match made in heaven. What’s on our Valentine’s Day Gift List this year you ask? Hanky Panky Signature Lace Low Rise Thongs in NEON! What’s on your Valentine’s Day List? Leave us a comment below! We’d love to hear from you.